The remarks of the candidates for Governor will also be videotaped and placed on this website, the new TrumpYes.org website (the short version of AmericansForTheTrumpAgenda.com) and on youtube together with the option for viewers to vote for who they think would do the best job of supporting the Trump Agenda as Governor of Virginia. Although the actual conference is only expected to attract a maximum of 100 attendees, the conference has regularly reached as many as 9,000 additional conservatives in Northern Virginia through its Facebook Fan page, paid Facebook advertising, e-newsletter, website and announcements posted at other organizations through their Facebook page and email newsletters. Conference news and speakers at the conference is also followed by many leaders of the conservative cause, which has seen over 75 co-sponsor organizations since it was founded in 1999. The former Executive Director of Americans Against the Obama Agenda, Jon Moseley, actually introduced one of the candidates for Governor, Corey Stewart, some six years ago at the Freedom Leadership Conference in Northern Virginia. Stewart and the other candidates for Governor – former GOP national chairman Ed Gillespie who came close to winning his last bid for statewide office in Virginia, Denver Riggleman, and State Senator Frank Wagner were all invited to speak at the February conference by email and letter this past Monday. The new Americans for the Trump Agenda – also known as TrumpYes.org – is sponsoring its second conference Freedom Leadership Conference, having done so once before as the original Americans Against the Obama Agenda. 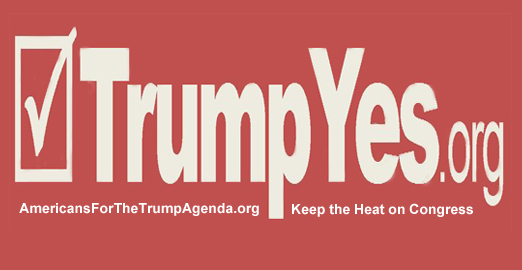 A brand new TRUMP YES button and vinyl bumper sticker will be given out free to conference attendees. Candidate Ed Gillespie is considered the frontrunner by political pundits because of his name recognition due to his past run for U.S. Senate in 2014 as the GOP nomination and his narrow defeat. Supporters of the other candidates point out that public opinion polls and name recognition mean very little this early in the campaign. Prince William County Board of Supervisors Chairman Corey Stewart points to his being one of the first supporters of a crackdown on illegal aliens in America, which he actually announced at an “Arizona Day Celebrate the Rule of Law” rally at Freedom Leadership Conference 6 years ago, and his early and vocal support of Donald Trump during last year’s primary and his service as State Chairman of the Trump campaign. This year there will be a voter-primary instead of a convention and the campaigns are just starting to heat up. Corey Stewart campaign Manager Spence Rogers, a former US Army Ranger, Bronze-star decorated combat veteran and Cruz campaign operative, told one of our conference leaders that his candidate has the best chance to appeal to Donald Trump and Ted Cruz voters, which would lock up the nomination for him. State Representative Scott Wagner is bucking the trend by emphasizing his 25 years experience a Virginia state legislator and the only candidate with that many years of experience. He also emphasizes that he is the only candidate who has been a successful businessman and the only candidate who has actually served in the armed forces. The very articulate conservative Denver Riggleman, who already has strong support from many movement conservatives, believes his track record contrasted with the other candidates wrong position on some issues and in some cases their refusal to openly endorse and campaign for Donald Trump for President, best positions his campaign to win the GOP conservative voters who will choose the GOP nominee and hopefully become the next Virginia Governor. If you want to learn more about the candidates or if you already have an opinion and want to show your support and also cast your ballot for your favorite don’t miss this Freedom Leadership Conference to be co-sponsored by Americans for the Trump Agenda reserve your seat HERE. Because a full capacity crowd is expected we are only making available tickets for the 5 to 6:30 PM dinner (doors open 5 PM) with the Governor Candidates, and a “Waiting List” for those who only wish to come to the 7 to 9 PM Conference (only $5, doors open 6:30 PM, reserve HERE. If dinner attendees fill the conference room we will notify those on the waiting list three days before the Thursday function of this, or if seats are still available we will let them know in the order (date) of their RSVP reservation. Because a number of people did not show up to claim their RSVP, this time we must ask full payment for the $5 admission service charge. We do not wish to turn people away from the conference again because we held seats for people who did not then show up to claim their seats. The last five Freedom Leadership Conferences of 2016 had a full capacity crowd including the all day conference in November at this new, better and expanded-size Wingate by Wingate Hotel venue in Chantilly. 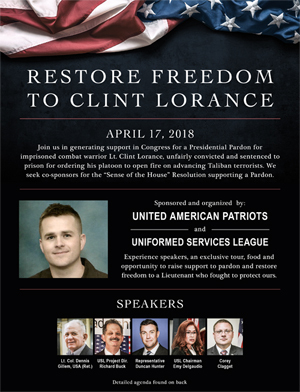 Americans for the Trump Agenda, the co-sponsor of the February 16 Freedom Leadership Conference, will be joined as a co-sponsor by an original founding organizer 17 years ago, United States Intelligence Council, which has been a sponsor every time over the years.